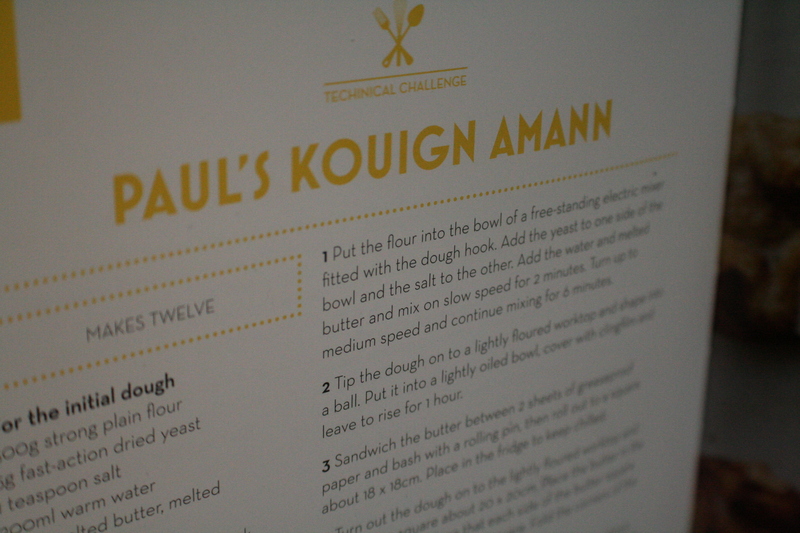 Week 6 – Damp Lemon and Almond cake, sounds delicious!! Ok, so should anyone be paying attention. Last week should have been week 6, but it was sunny and a bank holiday weekend 🙂 So I did other stuff 🙂 Hope you all took advantage of the weather. If I’m honest it was a teensy bit warm for me but no worries it has already cooled down. This recipe is from Nigella’s How to be a domestic goddess. 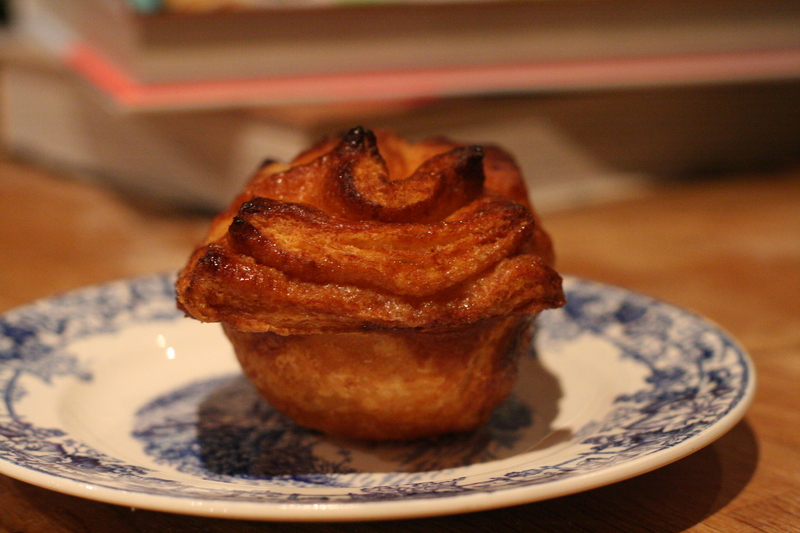 As ever I have tweaked the recipe a bit to suit me. The main issue with this recipe (to be fair Nigella does mention this too) is that it can take anything from 30 minutes to 1 hr 10 to cook this cake. It means that you will be oven hovering for a while armed with a skewer!! My oven took 45 minutes to cook this today. You know your oven best, whatever happens, you should start checking from 30 minutes. Now this is where I tweak things slightly. Ground almonds tend to come in 200g bags. This is technically not enough for this recipe if you follow Nigella’s list above. The last thing I want to do when I bake a cake is to buy more stuff than I need, and have it sitting around until I need whats left. So I use my 200g bag of ground almonds and top up with plain flour. I have made it as per Nigella’s recipe and with my alteration. I cannot spot any difference. My other addition is 1 tsp baking powder and 1/2 tsp bicarbonate and if you have it a large spoonful of buttermilk or yoghurt. You can leave these additions out but I find they lighten things a bit so the cake is less dollopy !! 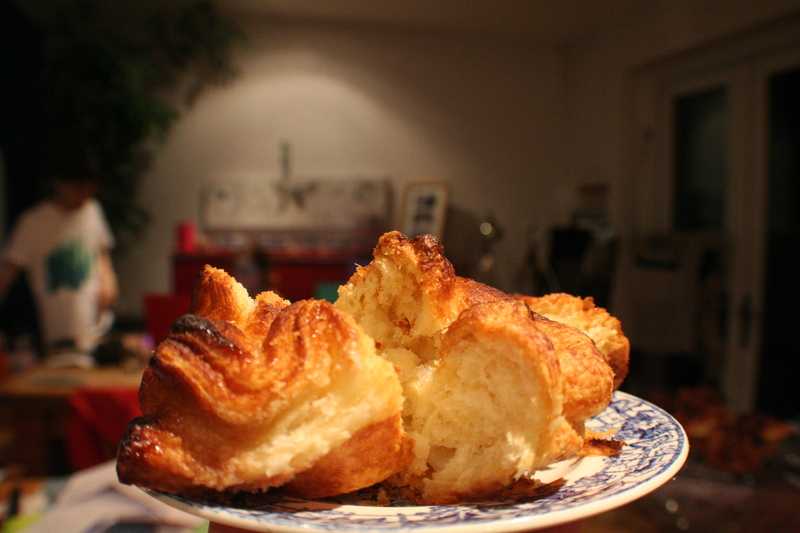 Cream together your butter and sugar till light, fluffy and pale. Beat in your eggs one at a time with a 1/4 of the flour after each egg. Gently stir in your ground almonds or ground almond/flour combo/bicarb/baking powder and buttermilk. Then add almond essence and zest and juice. The mixture will look very close to splitting. First time I made this cake I added more flour because I thought, yikes it is far too wet. Resist, I promise it will be fine. 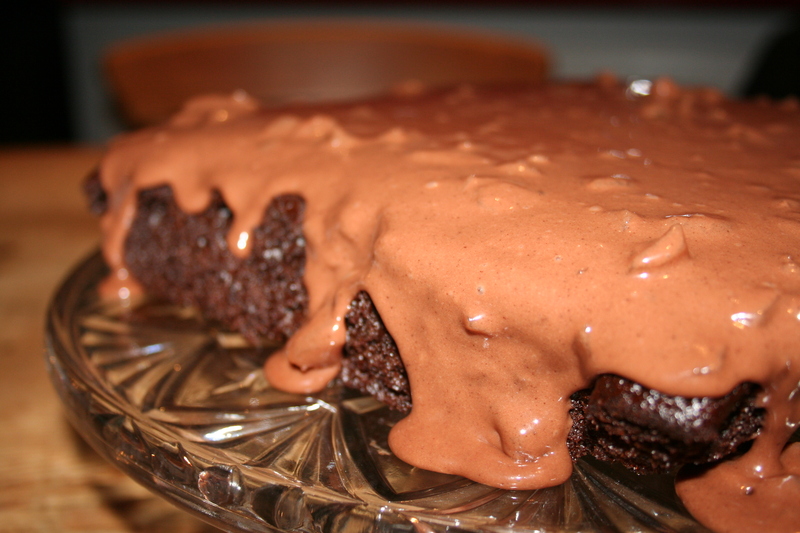 The whole point of this cake is a damp (hence the title) texture. Sounds yuck but tasted scrum. Pop your mixture into your prepared tin and bake in the oven for around an hour. As I mentioned before, start checking after 30 minutes, popping a skewer in. You want the skewer to come out cleanish. Think damp!! If it looks like it needs longer but is browning too much, give it a tinfoil hat and pop it back in the oven. I would suggest checking every 10/15 minutes or so. Once cooked, leave it in its tin for 5 minutes to cool before turning it out onto a wire rack to finish cooling properly. Nigella then tells us to wrap it in foil and leave it for a couple of days before serving. This does of course improve the flavour and texture of this cake but I have never left a cake hanging around for days. It tastes yummy eaten straight away with icing sugar sieved on and served with fresh raspberries and a cup of tea. P.S As part of this year long project, I decided to make a granny square every week. Colour generally inspired by that weeks make (or what is in my scrap basket!!) This week I have made a lovely raspberry coloured square inspired of course by the raspberries. Really quite liking how the colours are starting to go together. Along with the rest of the nation, my family and I watched The Great British Bake Off, September 17th episode. This featured a technical challenge that required a certain degree of skill in even pronouncing the item they were baking! I would stress that you need to read the recipe thoroughly, it is an unusual one. Having said that, it is also a recipe using ingredients you are likely to already have in your cupboards, especially if you bake your own bread. 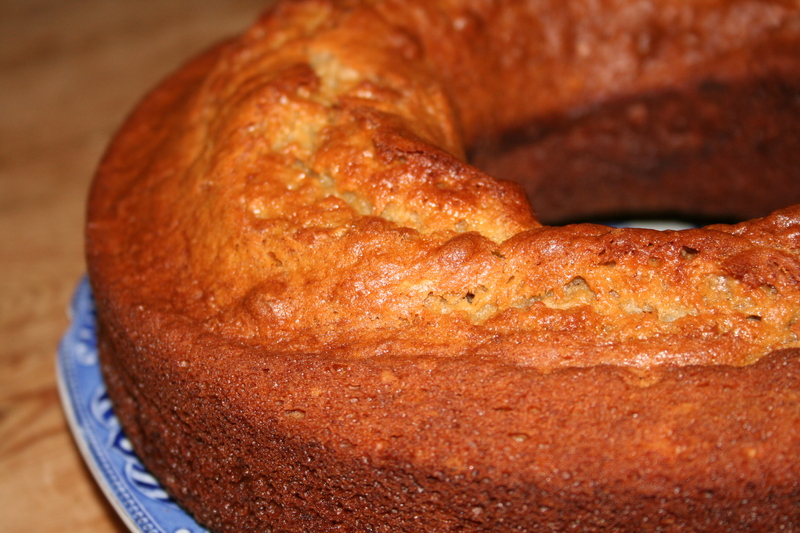 Banana bread cake a.k.a Banana Breakfast Ring. This is a real keeper, perfect for lunch boxes and as ever easy breezy to make. As always I have to make the nod to Nigella, Feast. This was the first cook book that I really started to try recipes from. Up until that point I would read cook books and stare longingly at the pictures. Nigella’s book made me want to have a go. Her recipes are easy to follow and that is what I wanted to achieve for my family. A collection of recipes that are reliable, tasty and good value. 450g mashed bananas. 3 medium bananas is about right, I have never weighed them and the recipe works fine. No stress baking here. Make sure the bananas are very very ripe. You know the ones that sit in the fruit bowl until you throw them away, they are perfect for this. 60ml corn oil. I never seem to have the right oil but vegetable/sunflower, even light olive oil all work fine. Preheat your oven to gas mark 4/180 degrees c. My oven is a little feisty so I find that 160 degrees c is about right. Oil your tin of choice, I have ring mould (1.5l) which makes the ring shaped cake that Nigella refers to but use whatever you have. I have also baked this cake using two standard cake tins and adjusted the cooking time. This is a really forgiving mixture so play around with whatever you have. In a bowl put your mashed bananas, add the oil, eggs, lemon juice and zest, vanilla and sugar. Whisk together. Then fold in your flour, bicarb and baking powder. Pour your batter into your oiled tin/s. Bake for around 40 minutes. As I said earlier you may need to adjust this depending on your tin choice. You’ll know it’s cooked when a skewer run through comes out clean and it has a bounce to it when gently pressed. I also find that when the teenagers start appearing it is nearly done. It does smell yummy when cooking. Take it out of the oven and leave it for around 10 minutes before turning it out to cool properly. This cake keeps for a good long while. I can usually add it to packed lunches for the week as well as snacks for after college. You can of course eat it as Nigella intended, for breakfast with a cuppa and a smidge of chocolate spread if you like. January is a tricky month to get motivated generally. Last week my middle son asked me for a lemon drizzle cake. As he is my favourite child (don’t tell the others!) his wish was my command. The following recipe was taken from Nigella’s How to be a Domestic Goddess. 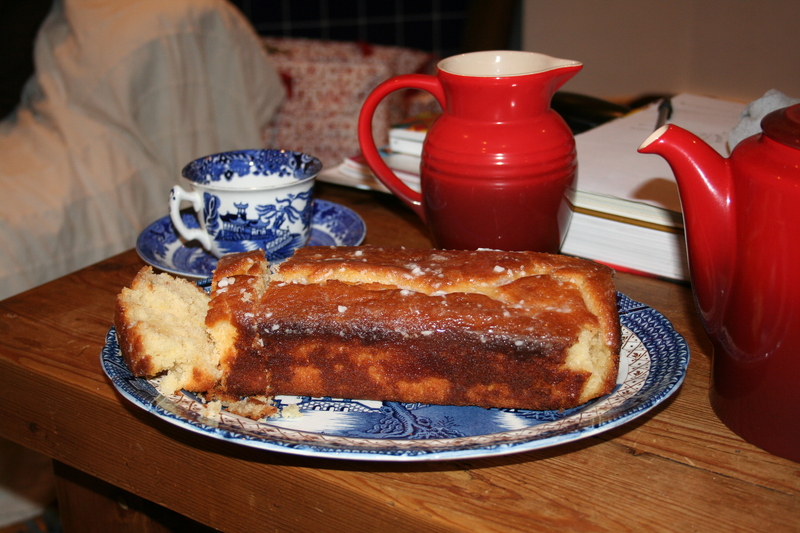 She has called it the Lemon syrup loaf cake, which is posh for lemon drizzle! As ever I have tweaked it a teeny tiny bit and have also adjusted the cooking temperature as well. This has been a long period of trial and error for me. 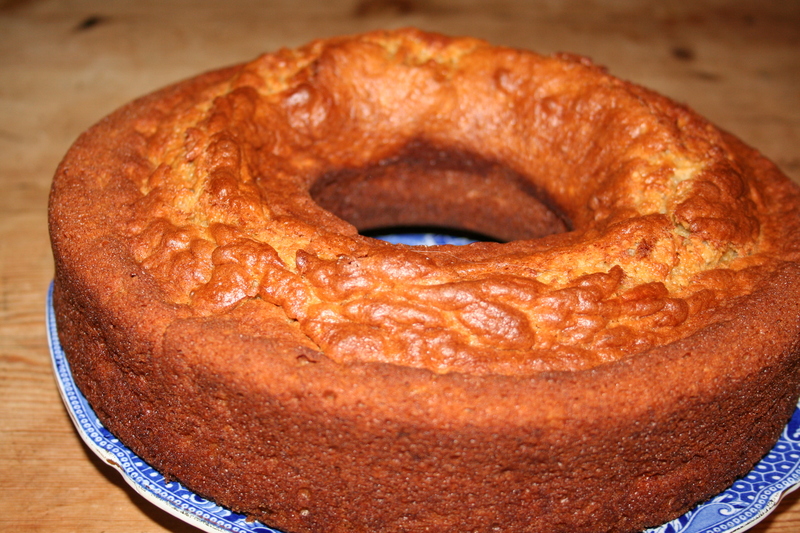 I usually find small cakes cook great in my oven but larger cakes can be a bit hit and miss for me. I will of course give you Nigella’s recommended temperature but for my Stoves range oven, fan assist I had to reduce the temperature 20-25 degrees C. Timings remained the same. Preheat your oven to 180 degrees C/gas mark 4. As I said in my intro you may need to adjust according to your oven. Cream together your butter and sugar. Do spend a bit of time on this. The more you blend and mix the lighter the cake mixture will be. Cream until smooth and pale. Beat your eggs and add them to the butter and sugar mixture. Add the zest too. Mix well. 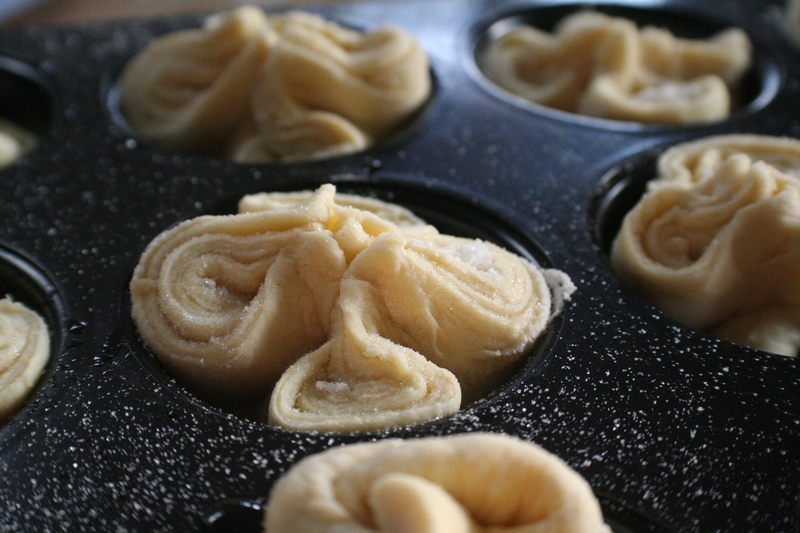 Then add in your flour and salt, folding them in with a gently touch. Finally add your milk or milk and buttermilk combo. Spoon the mixture into your prepared loaf tin and bake for 45 minutes. While your cake is cooking gently heat the lemon juice and icing sugar for your syrup until the icing sugar has dissolved. Stick a skewer in to check it if cooked. It should come out clean if properly cooked. Immediately skewer your cake all over to create holes that you can then drizzle your syrup into. Pour it slowly or even spoon it on taking care to make sure that the whole cake gets a good soaking. According to Nigella this serves 8-10. 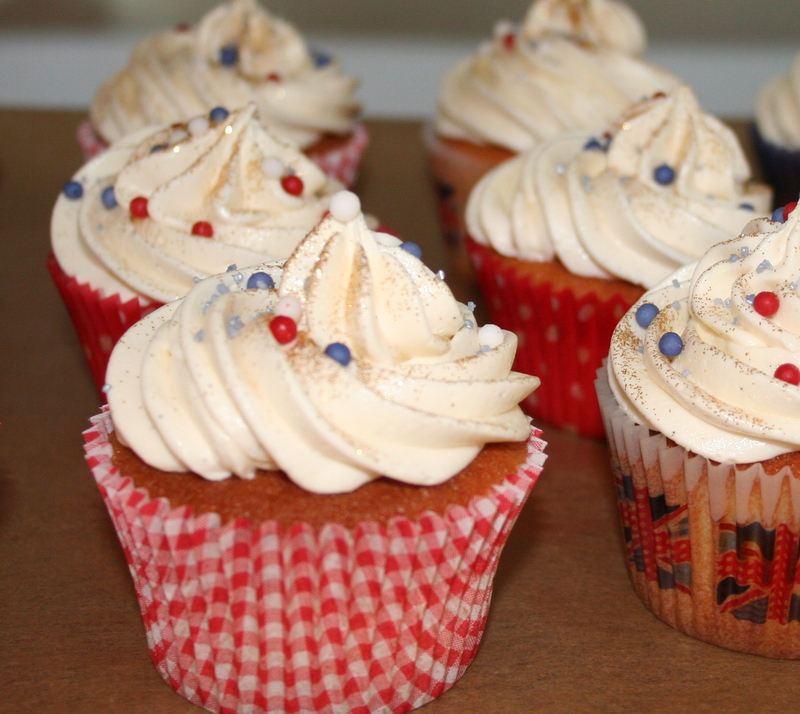 In my household it tends to serve a family of five with one who doesn’t like lemon cake! Share if you must, but there is pleasure to be had with a couple of your favourite offspring, a pot of tea and a slab of this cake. I have not been baking much lately. Silly really, as it is my greatest ally in the hunt for stress relief. Anyway, decided the other day that we needed something gorgeous to end the day with. So I dug out my old favourite, Nigella Feast, and proceeded to make the Chocolate Gingerbread, with of course a couple of additions of my own. The ingredients above work really well but I have added a few additions of my own. In a sturdy, large saucepan put all your sugars, syrups, butter and your spices. Gently melt them together and then take them off the heat. Let them cool a little. In a small cup (I usually use an espresso cup) mix your bicarbonate of soda and the water. To your syrup mixture, beat in your eggs, milk and the bicarb mix. Make sure the mixture isn’t too hot or your eggs will scramble! Then fold in your dry ingredients. Pour your mixture into your prepared tin and bake for around 45 minutes till the top is risen and firm to touch. Now this cake is lovely without icing, in fact if you leave out the chocolate chips it has the texture of a jamaican ginger cake and as such is lovely eaten on a Sunday afternoon with a nice cup of tea. 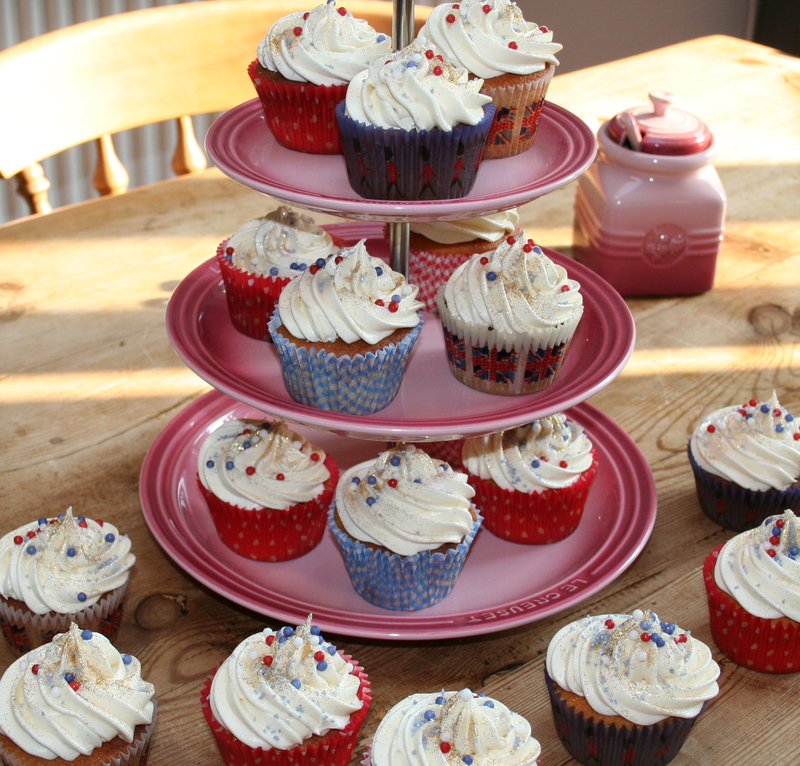 However if you are feeling indulgent then the icing is a dead easy addition. For Nigella’s icing – sieve the icing sugar into a bowl. In a saucepan melt the butter with the cocoa and ginger ale and then combine the ingredients to make a gorgeous glace icing. Pour over your cool cake and consume. For my icing – in a bowl sieve your icing sugar and cocoa and add the chopped stem ginger. Then add about 2 tablespoons of your syrup and a little warm water. 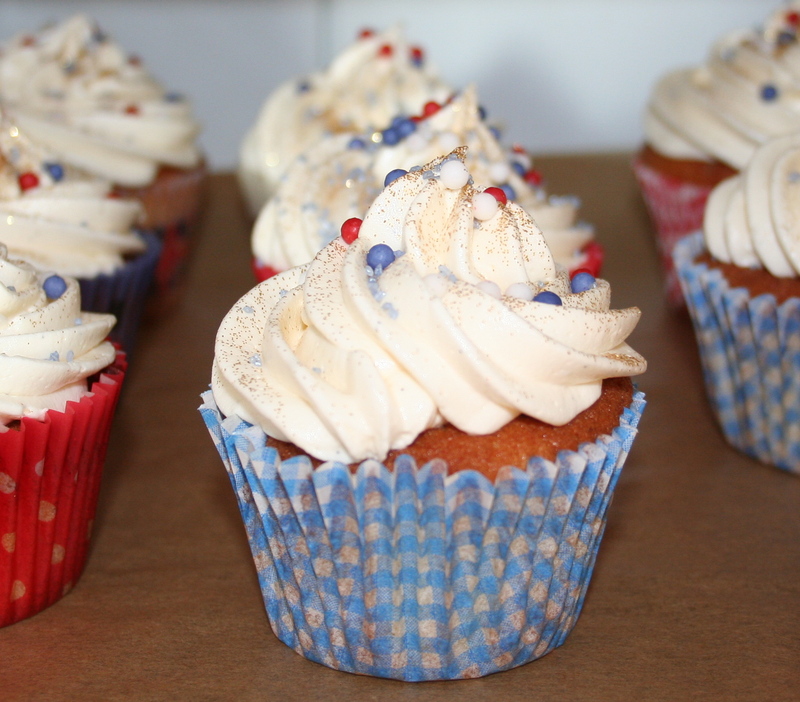 Mix to the consistency of a pouring glace icing. Pour over your cooled cake. Well, what can I say. 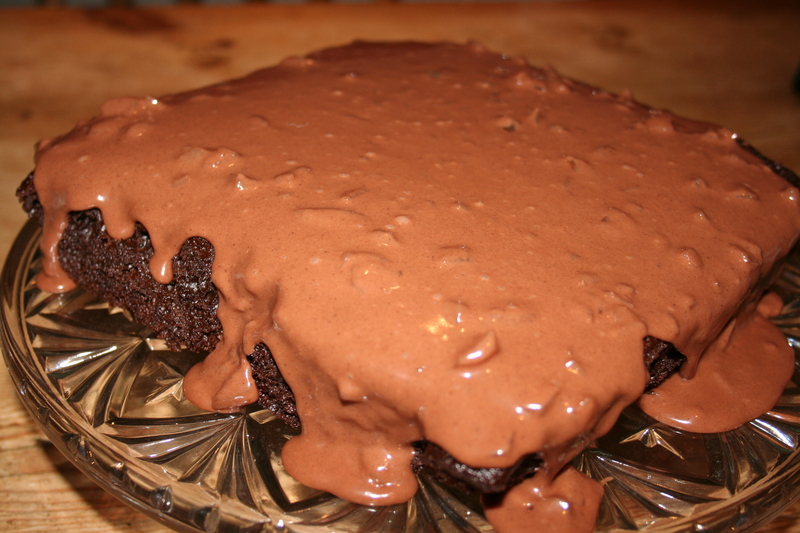 This cake is a family favourite and also keeps for days. In fact the longer it keeps the better it tastes. It’s not the prettiest of cakes, the icing has lumpy bits of ginger in it that somewhat ruin the aesthetic! But it is yummy and that more than make up for it’s ugliness. Mini Pavlova with chantilly cream and strawberries. 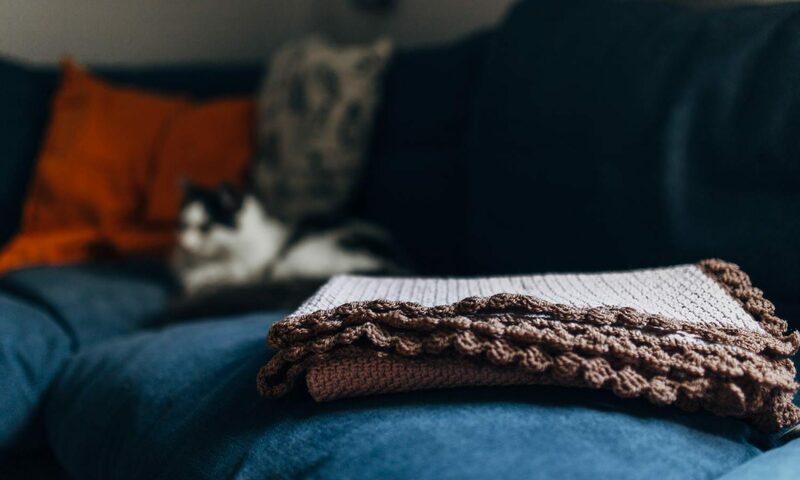 Well long time no blog again. I really must post more frequently. The whole point of me blogging recipes, was so that my offspring would be able to prepare tasty treats, even if I am unavailable, either through death (bit extreme) or if by some miracle I decide to get a life. Actually kids or no kids I suspect I will always be baking as I do indeed love it. I also love how smiley people become when you have fed them something that clearly delights. The following recipe was one of those happy moments. Downside, I can’t bake this too frequently as it is one of my absolute favourites and I have been known to eat this for breakfast if there happens to be some left over!! Fruit of your choice – british strawberries of course at this time of year are the best but raspberries, blueberries work equally well. One or two baking sheets lined with baking parchment. In a clean bowl ( must be spotlessly clean in order to achieve super stiff peaks on your meringue!!) put in your egg whites and whisk until the mixture is firm and forming those stiff peaks! It should stay in the bowl if you up end it over your head. Then gently whisk in spoonful by sparkling spoonful of your caster sugar. Your meringue should become firm and shiny. Gorgeous like you. 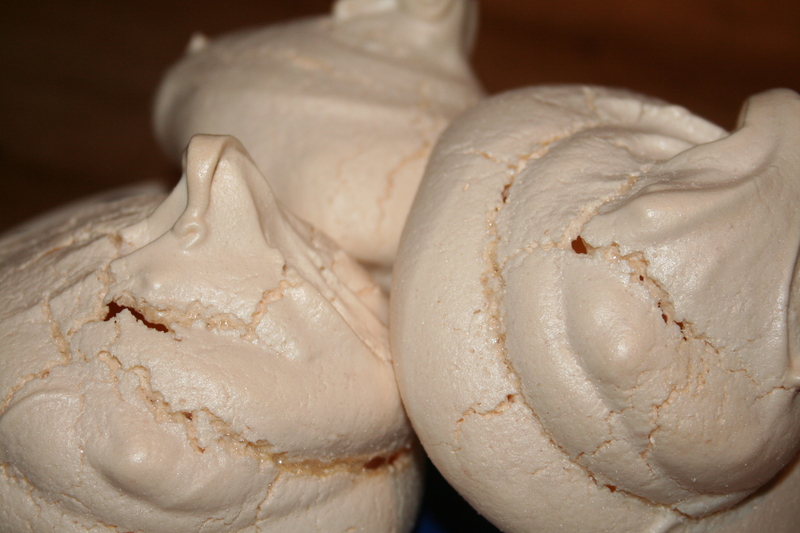 Dollop your meringue onto your prepared baking sheets. You can either make one or two pavlova bases with this mix or around a dozen or so mini pavlovas. It really does depend on how generous you are. Don’t make them too small as quite frankly this is not a recipe to worry about portion control. Once you have your pavlova/s ready to go in the oven. Pop them in and immediately turn the oven down to 150 degrees C and then bake for 1 & 3/4 hours for a large pavlova or 30 minutes for the smaller ones. Then turn the oven off and leave the large one in the oven (door open) until it is cool. The little ones can be left in for 30 minutes oven off door shut and then remove from the oven to cool completely. 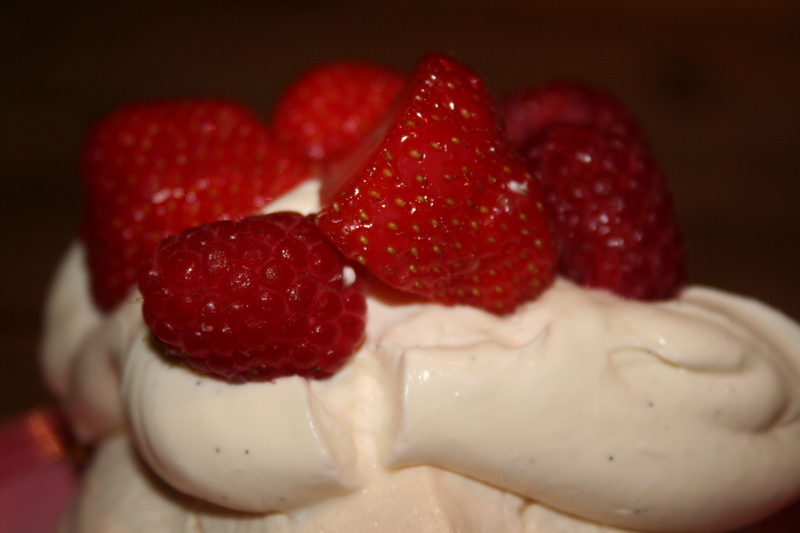 For your chantilly cream, pour the double cream into a bowl and whisk until you have thick custard consistency cream. 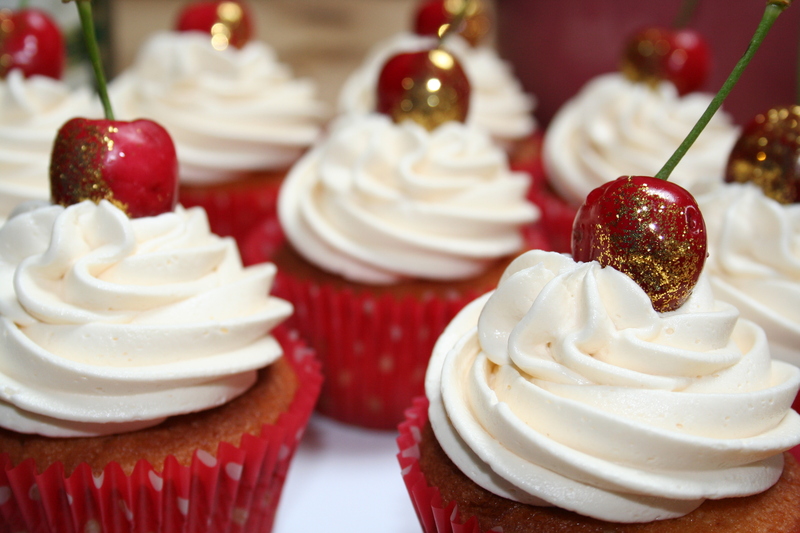 To this gently whisk in your icing sugar and vanilla paste. I use a hand whisk at this stage as if you over mix your cream will be too think and hard to work with. 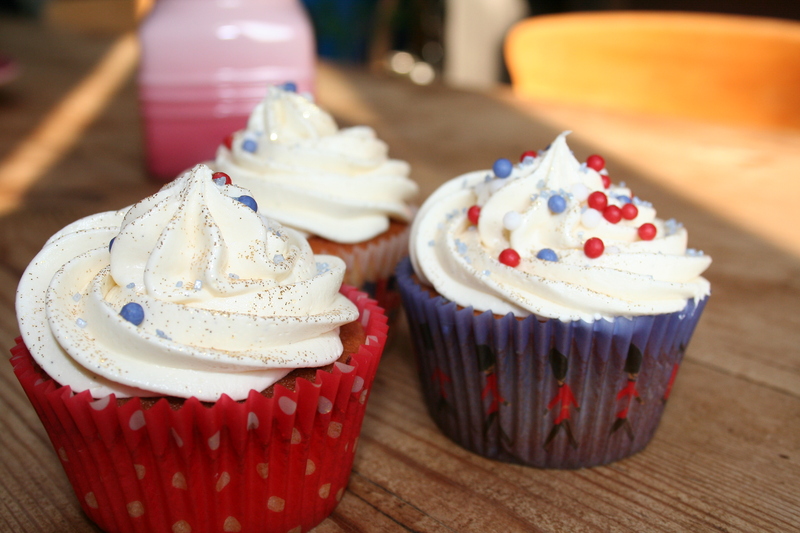 I find a couple of tablespoons of icing sugar is adequate but really adjust to suit you and yours. 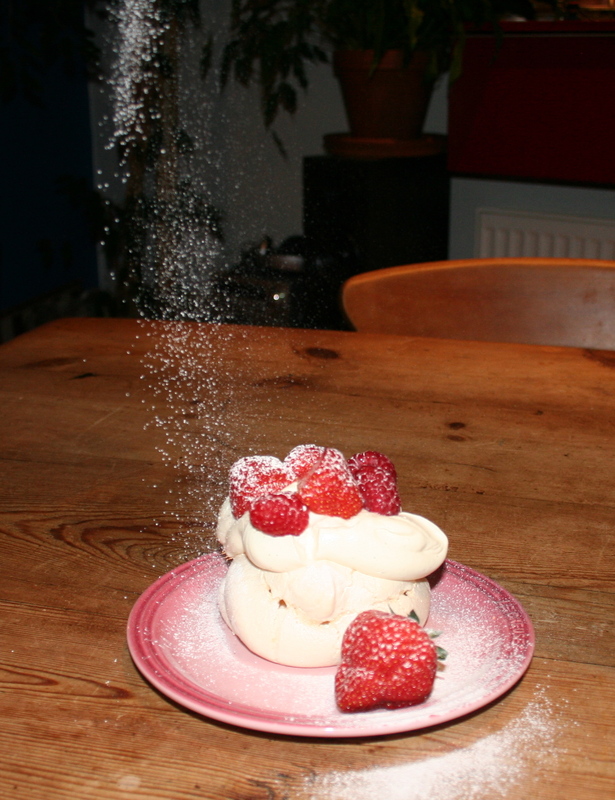 Once your pavlova is cool you can dollop the top with cream and your chosen fruit.